Cacio e Pepe Two Ways — Dine on In! Cacio e Pepe. It's pasta, rolled in peppered butter and then rolled again in cheese. 😉 It's a crowd pleaser for sure! You can make it gluten free or grain free and plant based if you wanted to use veggie "noodles". Grate 1 cup of parmigiano reggiano or parmesan cheese and set aside. Boil and salt a stockpot full of water. (I usually fill the pot 3/4 full-the water should taste like the sea). Add 1/2 to 1lb of bucatini or spaghetti noodles to the pot and cook to al dente. Melt 4 tbsp of butter (if you are dairy free, use an alternative) over a low heat pan. Add 3 tbsp of course pepper (fine pepper is fine too- it's all good). Turn off heat and let it steep while the pasta cooks. Remove 1 cup of pasta water and set aside. Drain the pasta. Turn back on the heat to the butter/pepper mixture and add the pasta water. Add the pasta and the cheese and stir to coat the noodles. Serve immediately. (I like adding fresh broccoli florets to my pasta as you can see). Now onto the NEXT DAY leftovers. I usually always have leftover pasta, and when I can't give it away, I try to repurpose it into something else. Yes, I usually make frantic text and phone calls to my neighbors "to come and get extra food!" when I cook too much or post rants on my personal facebook and call up friends who work nearby. This of course is always in hopes that I can eat less of what I cook and share most of it. Sometimes it works, most times, I wind up eating most of it. The struggle is real friends. You know I LOVE breakfast and I love Frittatas. You often hear me talk about repurposing my brown rice to make a gluten free crust for a quiche. 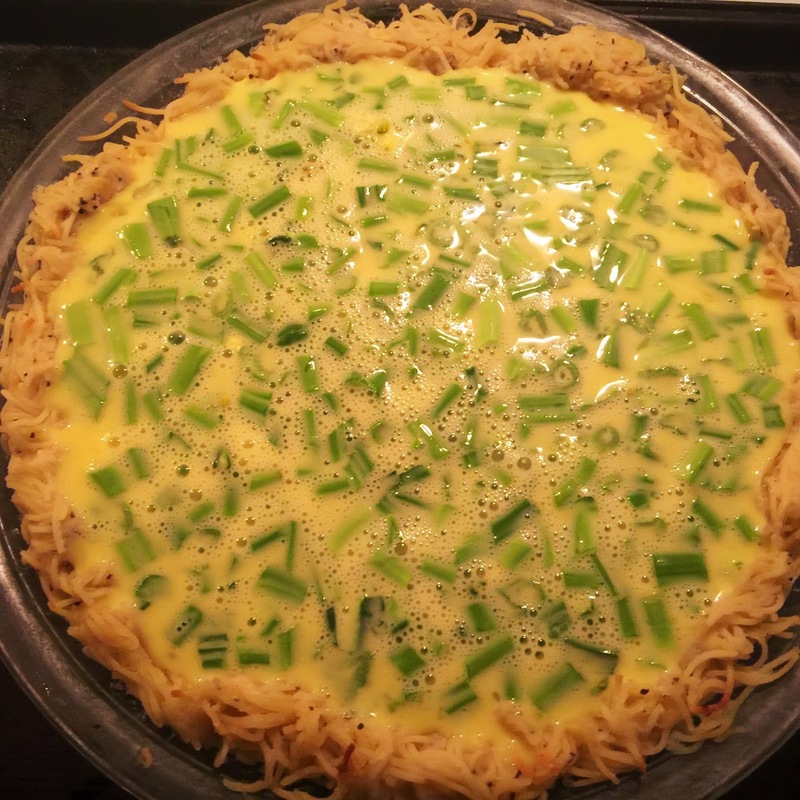 This time, I took the same concept and made it into a cacio e pepe quiche frittata. Check this out! I can't begin to tell you how DECADENT this was. Sure maybe it's not the HEALTHIEST of my dishes, but honestly- I like to indulge this way at times and so should you! This dish makes a perfect breakfast, lunch or a dinner. 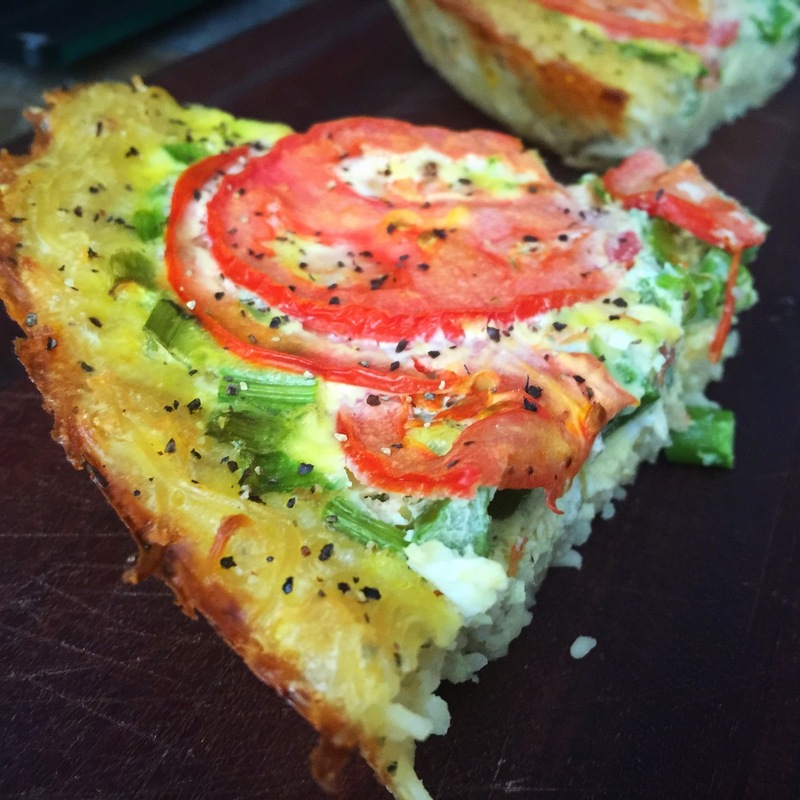 I could eat this quiche like frittata as any meal of the day; feel free to pair it with a salad for lunch and dinner. Perfect for Meatless Monday! Take the leftover pasta and press into a pie pan and bake for 20 mins at 350 degrees. (I usually do this the day before and set it aside in my fridge until ready to finish the rest of this dish). Mix 5 eggs with 1/3 cup of whole milk (if you are dairy free, omit the milk and add 2tsp of water) in a bowl and set aside. Cut up any vegetables. For this dish, I used the end stalks of the broccoli florets. They are usually saved and chopped so I can add to my morning hash. Set them aside. Slice 1 tomato top the entire dish. Bake the whole thing for 40 minutes at 350 degrees until the egg custard is set. sprinkle pepper on top and serve. Easy right? There you have it; Pasta TWO Ways. Go on and make it today. I'm sure you have all the ingredients handy.